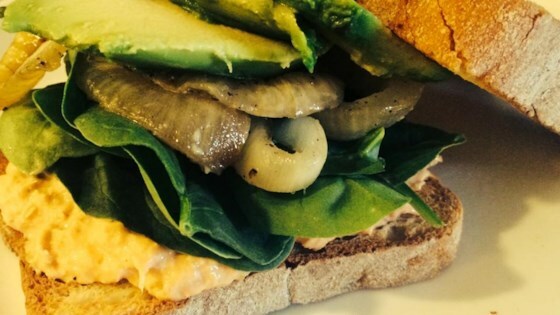 "'Tuna' salad sandwich with a twist (salmon)! Substitute to your liking to make it even more flavorful." Combine salmon, Greek yogurt, celery, mustard, lemon juice, garlic powder, salt, pepper, and paprika in a medium bowl. Preheat an outdoor grill for medium heat and lightly oil the grate. Grill 1 onion half until tender and beginning to caramelize, 5 to 7 minutes per side. Remove from grill; slice when cool enough to handle. Spread salmon salad over each slice of bread. Top with grilled onions, avocado, and baby spinach. Layers of show-stopping color & flavor! Mayonnaise can be used instead of the Greek yogurt, if desired. You can use 1/2 teaspoon celery seed in place of the chopped celery.